I've been looking at making some outdoor signs, but durability and edge gluing are leaving me hesitant. I would imagine cedar, teak, redwood are probably the best species for weather resistance, but is anyone using other common types? I've read Titebond II and Gorilla Glue are ok for edge gluing for exterior use. Anyone have a preference or suggestions? It sounds like Titebond III is the glue of choice then. My plan is to use 6" cedar boards, probably from Menards as they have the best selection of "clear" boards. It depends on the masking tape. I've had ok luck with some of the high tack blue kind. Frog tape was by far the worst. It all depends on how well it adheres to the surface. The only downside is it can gum up a bit. Citrus cleaner for cleanup is required. Liquid Frisket - looks like it's used primarily for watercolor, but I've read it works with wood as well. Worth a shot maybe? This product looks interesting for masking as well: http://a.co/6zYjkjALiquid Frisket - looks like it's used primarily for watercolor, but I've read it works with wood as well. Worth a shot maybe? Certainly - there are others out there that appear to be more economical. Just trying to think out of the box. Old fashioned varnish seems to hold up well in the weather, though may require a recoat every few years. It also blocks most UV light and will keep the wood from fading and graying as fast. If you thin the first coat a little it will soak into the wood better. I use cedar and then Cabots Spar Varnish. It's very thick but brushes smooth. It does give the wood a deep Amber look, some have described it as honey. What do you use to seal HDU? Love this! Are there plans for this? I bought the Adirondack chair plan at our local Woodcraft store. It’s a Norm Abrahamson Design from This Old House Show. 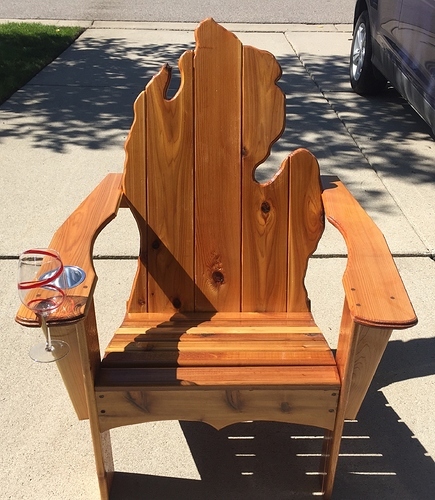 That’s the basic chair then I modified it to add the Michigan Lower peninsula. I edge glue five 1x6 Western Red Cedar boards together 27.5W x 31H. I iused a jig saw to cut out the arms and Michigan profile from the templates in the Woodcraft plan. I plan to take the templates to our local FedEx store and have them scanned so I can turn them into an acceptable format for Vcarve Pro.